The recently released This Is Where I Leave You is a comedy that brings together some of the most well-known comedians in the industry. The film revolves around the Altman family, where four grown siblings follow their deceased father’s wish for all of them to live together under the same roof for one week. Wendy’s laid-back loungewear may not seem like it would work in the classroom, but with a few twists, this getup looks trendy and chic while maintaining that comfortable vibe. 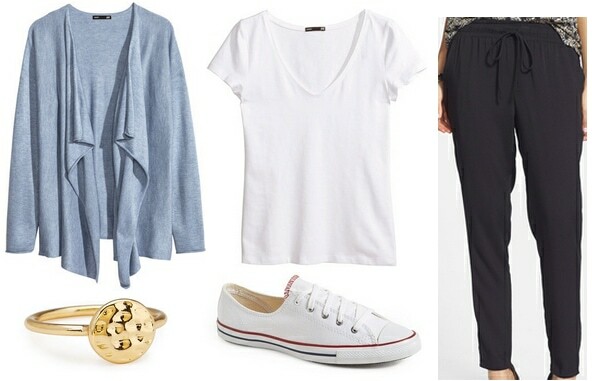 To recreate this look, pair a plain white tee with a light blue cardigan. The cardigan helps make the outfit look more put-together and also adds a bit of color. Although Wendy was wearing a pair of loose navy pants, we went with a pair of trendy fitted trousers for a classroom-appropriate ensemble. We kept Wendy’s classic white Converse, but if you want to dress this look up a bit more, you could always go with a pair of ballet flats. Complete the outfit with a simple yet stylish gold ring. This next outfit, based on Penny Moore’s ice skating look, is casual and involves plenty of basics, so it’s great for school or a casual weekend. Though the base of this ensemble is mostly neutral, it does incorporate pastel shades, which looks so soft and pretty in the fall. Start off the outfit with a gray sweater and a light pink scarf, as well as a pair of flared, dark wash jeans. The dark-colored jeans and gray sweater help make the pastel scarf wearable for fall. Even though Penny was wearing ice skates, you can snag a similar look with a pair of white lace-up sneakers. For the finishing touch, accessorize with some subtly sparkly jewelry, like these gold and rhinestone studs. Penny wore the ensemble above when she ran into Judd Altman during a night out, and this look is such a fun alternative to the typical dark-colored fall outfit. We can see this being worn for a night out on the town, but it would also be appropriate for dinner with the parents during the weekend or holidays. For this outfit recreation, opt for a loose-fitting bright coral top – it’s the statement piece in this look. Because of that, keep the rest of the outfit toned-down with black jeans, as well as black heels or flats. Finish with chic and sophisticated accessories, such as a tan-colored belt and gold hoop earrings. Have you seen This Is Where I Leave You? What did you think of the film and the outfits shown above? What movies would you like to see featured in future posts? We would love to read your thoughts in a comment below!